Is Santos Limited a Buffett stock? WASHINGTON (MarketWatch) — If waiting is the hardest part, investors are not going to have an easy time this week. A flurry of new reports ranging from new home sales to business investment to consumer spending are on the docket and the portrait they’ll draw is the same one Wall Street has been staring at for a while: slower growth in early 2014 owing to harsh weather. What investors are itching to see is if the economy began to bounce back in March, but they’ll have to cool their heels until the monthly employment report that will be unveiled in the first week of April. Narayana Kocherlakota, the president of the Federal Reserve Bank of Minneapolis and the lone dissenter at the Fed’s meeting this week, tells WSJ’s Jon Hilsenrath why he doesn’t believe the central bank is necessarily moving toward a more “hawkish” monetary policy. “None of the reports is going to alter the overall picture of the economy,” said Scott Brown, chief economist of Raymond James. That’s not to say these reports won’t offer any hints. A drumbeat of surprisingly negative numbers, for instance, could inject more uncertainty into financial markets by suggesting the economy has slowed for reasons unrelated to the weather. Or a cascade of upbeat results would nourish the prevailing perception that the economy is about grow like a lawn laced with an extra springtime feeding. Sales of new homes are supposed to keep rising in 2014 to help support a stronger economic recovery, but there are a pair of obstacles standing in the way. One is rising home prices: two indexes released on Tuesday, Case-Shiller and FHFA, are expected once again to show big increases in the cost of buying a home compared to a year earlier. The other problem is higher mortgage rates that have pushed some prospective buyers to the sidelines. Despite those obstacles, sales actually surged in January to a five-and-a-half year high, but the monthly numbers are jumpy and prone to big swings. Economists predict new home sales will fall sharply in February, based on a roughly 10% drop in mortgage applications last month. Orders for durable goods, a report that offers a good window on business investment, has also been erratic lately. Order have dropped two straight months and could dip again in February. Bad weather gets some blame as does weaker demand for expensive commercial jets. Fitting a typical pattern, Boeing has taken fewer orders in early 2014 after a big surge in the waning months of 2013. That’s what often happens at the end of one year and the start of the next. More worrisome, business investment excluding the military and commercial aircraft has declined in three of the past five months. Another drop in that closely followed category would raise a red flag since other indicators imply a small though hardly robust acceleration in demand. “All in all, manufacturing remains tepid,” economists at IHS Global Insight wrote in a report. On Thursday, the government is likely to raise its estimate of how fast the U.S. grew in the fourth quarter, but the report will shed little light on the current health of the economy. The source of the expected upward revision to gross domestic product was a big spike in spending on health-care services. Whether that’s actually a good thing for the economy or a quirk somehow related in part to Obamacare is unclear. The law that revamps the U.S. heath-care industry took effect in January and there have been anecdotes of higher spending related to its implementation. 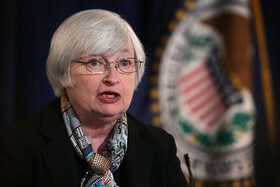 Meet the new Fed chair, same as the old Fed chair — but more specific. And maybe more passionate, writes Tim Mullaney. Jobless claims, also due Thursday, might draw more attention than GDP because it’s more current. The number of people applying for new unemployment benefits has been trending lower lately and that’s usually — but not always — a sign of an improving labor market. Yet consumer spending, normally one of the biggest reports each month, might not offer any tantalizing clues on how Americans are doing. Wall Street expects a modest 0.2% in consumer spending — the fulcrum of U.S. economic growth — and a similar gain in worker incomes. Purchases at auto dealerships perked up in February, but people probably drove less and energy bills may have fallen after a January spike to keep consumer spending on the milder side.